Dark Ages 1965 L to R: Mick Sibley, Clive Coulson, Vaughan Stephens, Ian Thompson and Darryl Keogh. 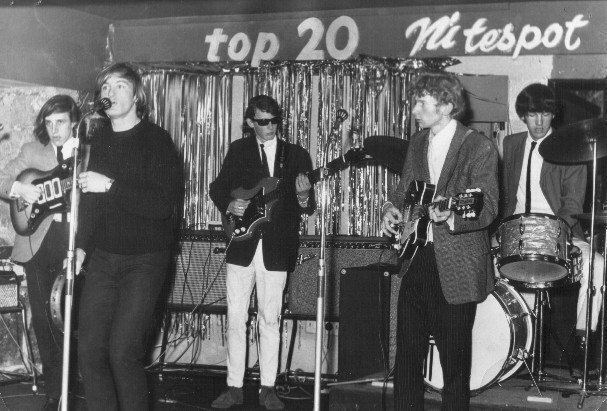 The Dark Ages was formed in 1964 by a group of five teenagers from South Auckland who were keen to take an alternative approach to music and their on-stage appearance. The band was influenced by early British R&B groups, such as Downliners Sect, the Pretty Things, the Yardbirds and the Rolling Stones. Darryl Keogh left in late 1965 and was replaced for a brief period by Red McKelvie. L to R: Mick, Clive, Vaughan, Red McKelvie and Ian. The Dark Ages were arguably Auckland's first "alternative band" who quickly built up a cult following and played regularly at several local Auckland night spots. Their energetic music and distinctive appearance was never accepted by the establishment and the band found it difficult finding regular gigs at least at the mainstream local dance halls. They toured the North Island, played South Auckland halls, socials and eventually disbanded in 1966 after 2 years. Clive Coulson joined the Rayders in Hamilton and when they quickly disbanded, teamed up with Kevin McNeil in a new version of his Mods. In 1967 Clive then moved to England, retiring from singing to become involved in roady work for the likes of Rod Stewart, Jeff Beck, Led Zeppelin and Bad Company. These days Clive is farming back in New Zealand at Raglan. Mick Sibley joined the Underdogs as vocalist and harmonica player for a period and then left to concentrate on his other interests while rediscovering roots music. He now plays acoustic and performs regularly on the local folk and blues circuit. Darryl Keogh was unfortunately killed in a road accident in the late 60's. Ian Thompson joined the original line-up of the Underdogs and continued to play with other various Auckland bands, including the Brew, and is still playing regularly. Vaughan Stephens died in the 70's of drug related problems. Red McKelvie, who had previously been with the Chelsea Beats, went on to play in a number of other successful bands, that included Ray Woolf and the Avengers and Cruise Lane, before heading to Australia where he was a member of Quill, Flying Circus, Powderhorn, Third Union Band and Richard Clapton Band. These days he remains a professional musician based in Timaru. During their early days in 1965 the Dark Ages released one single on the Red Rooster label. It was called "Tomorrow's Gonna Be Another Day" backed with "Cadillac". There would seem to be some confusion or errors regarding the Dark Ages in some publications that are around and I am grateful to Mick Sibley for putting the facts right.